Unlike my other headphone purchases, I have not had these guys on my head yet so I am on the fence about these due to the lack of balanced inputs and my inability to compare them to anything I already own or want. I checked out reviews on the originals and from what I can glean these are good headphones but the audio quality is not to the level of the Stax. My question is this, Which stax? I have HD 800s and so do not feel the need to get the l higher end stax but loved the L300 that I used to own. They were not the level of my 800s but better than anything else in the same price range (that I have heard). Has anyone compared the two? If so, how would you rate them in comparison? I can get my hands on another Stax SRS-3100 (L300 and amp) for around $650 if the yen stays low to the dollar since my best friend is going to Japan in November but, if these compare I would consider picking them up. Any input from the community would be greatly appreciated. The ESP950 is not comparable to any STAX. It's much more comparable to a Sennheiser HD6XX, but with less bass - noticeably rolled off on both ends, mid focused, somewhat soft in its presentation, no subbass to speak of. Nothing like the punchy, more forward, and energetic L300. The ESP950 does have good clarity, speed, and detail, but not to the level of the L300. Subbass and midbass are noticeably less than the L300, will never have the midbass punch of an L300 nor the low end presence - even with EQ. It's really good for vocals.... Jazz and classical are lacking without EQ for the bass to get it more natural sounding. Standup acoustic bass and drums just sound lacking until you add quite a bit low end EQ. Took Schiit loki 20Hz knob at ~3:00 position for them to sound proper. Without EQ they were unacceptable to me. L300 without EQ is fine. I will say the comfort of the ESP950 is undeniably better than the L300 and it's EXTREMELY lightweight, noticeably lighter than an L300. Quality is their main issue... they will squeal sometimes and drive you crazy.... just not the same level of quality as STAX. Once I got my STAX L300 had zero interest in listening to the ESP950 anymore and sold them off. I was content with the ESP950 until the STAX arrived and I heard the difference - both being driven off a STAX SRM-323S driver for direct comparison. 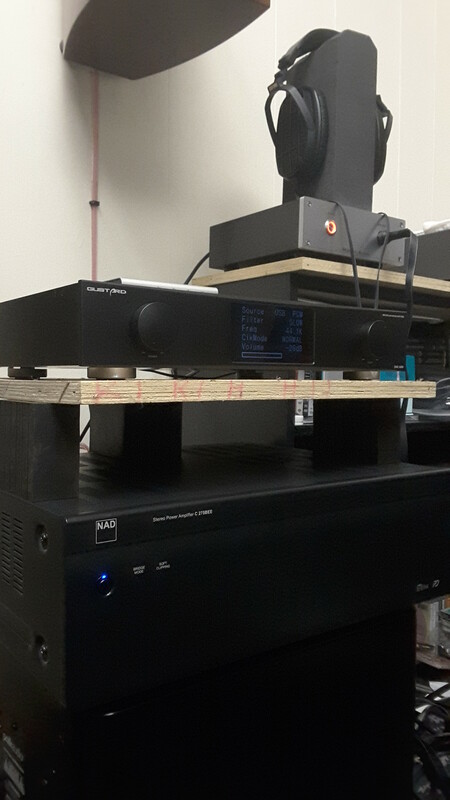 Normal rig used for the ESP950 was a Mjolnir Audio SRD-7 powered from NAD C275BEE stereo amp and Gustard X20U DAC to drive them... which is well beyond the level of STAX SS drivers in regards to bass and fullness of sound. I tried the Vesper Audio pads from Darin Fong and prefered the stock pads. Sure the Vespers are more comfortable, but I did not like the change in sound that resulted. While it gained a little in the low end, it also gave slight loss in clarity/detail and a slightly flatter sounding midrange. The ESP950 are a great value for entry into Electrostats... but they are not STAX. Thanx much Vracer, that pretty much solidified my decision to go with the lcd 2 classic closed back today and then the Stax in November. Only difference is that I might go with the 500 or 700 instead of the 300 that I gave to my buddy. So many decisions I just don't know what to do with myself. This rabbit hole is deep and never ending.. lol. I know that by november I will probably be considering the ether flow c instead of the stax... face palm. Have you tried any of those? If so, how do they compare to the 800s? Last week I auditioned the LCD2 Closed and wasn't impressed, tbh. The sound wasn't robust. Seemed thin and brittle throughout and the sound stage a bit narrower than other closed back cans I have. I might go for the open back ones, however. Although Mr. Speakers Aeon Flow are tempting me. Thanx for the heads up, I already paid for them and they will arrive next Friday if they are that bad then I guess I will be sending them back and may exchange for the the opens or find something else. The deciding factor was the 15% off discount which just pushed me over the edge considering I was getting them cheaper than the opens. Sigh, I am not going to be happy if they sound that bad. Appreciate the info. My preference is for slightly accented sub-bass, midbass with decent punch, mids with nice fullness and weight to them but not too forward, and highs with energy and clear detail. So a dynamic, punchy sound with good clarity and detail. My favorite dynamics are modded Fostex TH-X00PHs. Have only heard an HD800 not the HD800S, not really my type of headphone - much rather the STAX Lambdas for a high end headphone. Right now, as in having spent this afternoon listening to them, I'm actually shifting my opinion on the Modhouse Argon Mark 3's I recently got in. Was nearly a 12 week wait for them and expectations were high - wasn't feeling them at all during first listen and was fairly dissapointed. Left for a headphone meet last weekend with them and was still dissapointed. Today, with my spare Gustard H10 amp at work, I experimented with pre-gain changes and now they are showing their true colors... stupendous bass both in extension and punch, with great speed and nice detail, and good sense of space to the sound. Thinking their bass is beyond the TH-X00PHs level now where previously it was not even up to it and their detail has come out. With the Dragonfly Red DAC/amp connected to the Gustard H10, and the H10 pregain switches set to +12dB it really has come alive. The longer I listen to the Argon MK3s, the more I really, REALLY like them... they are pretty much in line with most of my sound preferences. If you get a Japanese STAX system, don't forget will also need to get a power step -down transformer to safely run at proper voltage without over-driving the unit (100V for Japan)... running it at over voltage will damage it over time. just out of curiosity, have you tried the 1more's yet? I have had these things on my head for two almost two weeks now and just can't get over the sound. When I first got them they were a bit sharp on the high end but now that they have broken in that sharpness is gone and the lows have really come into their own. Even the mids have improved and their mids were not much to talk of at first. It was more like the headphone disguised the weak mids with the tuning of the highs and lows but now that the highs have normalized I can hear the mids so much better and while they are not high end clarity, they are killing my five and six hundred dollar headsets considering I am getting as good a performance out of them for $250 (on Amazon). I do have cans that out perform them but they cost 3 times as much so either I am a horrible can picker or these things are that damn good. As for the stax, I had the srs3100 which is the L300 and the SRM-252S package. I loved them but wound up giving them to a buddy of mine that was going back to the sandbox as a going away present. So yes, I know about the power requirements and luckily I still have my power converter from when I was stationed in Japan, I purchased a converter that was dual power so it works doing down stepping or up stepping. My hearing is a bit shot which means that I tend to not hear soundstage unless it is extreme so that tends to be low on my list of things to look for when considering headphones. I do hear left right shifts and the airy sounding difference between open and closed makes a difference in how it sounds but for the most part that has to do with the ambient noise more than wider and narrower stages. Even on my home theater I can change the sound stage and it is pretty much lost on me unless it is a sound stage that has a lot of reverb and even then I don't get the open sound as much as I do echo. The one more is a great example of what I want in my headphone sound, it has range, gives great low end without taxing the highs and mids and has more clarity than anything else in its immediate price range that produces the lows it they do. I love my 800S but even they don't give me the lows I like, but the clarity and precision of the the sound from top to bottom is absolutely amazing to me probably my favorite headset for classical music and other detail genres. I have found more often than not that this pursuit is very subjective, we all have different tastes so what is amzeballs to one person may be crap to another. Hopefully the money I paid for the LCD2 Classic closed will work out for me. I know Z had great things to say about the opens and I found that his audio tastes is pretty close to mine so maybe I'll get lucky. Yes, I had the 1 More Triple Driver Over ears, got them on here for $200. They were very nice sounding, like a baby TH-X00PH - I really liked their sound. They were not comfortable though... more on ear than over ear, could not wear them for more than half an hour without discomfort. Gave them to a friend of mine. Saw they are/were on here now for $150. Have you ever thought about the LCD XC? They have THE best lows I've ever heard from a headphone. Mids as well, female vocals are like nothing else I've heard. The only problem for me is the weight, and they are very hard for me to wear for extended periods. I guess that bubinga (sp) wood is HEAVY. I am considering putting them up for sale in the next week or so to get in on the Mr Speakers drop. The XC's are probably the best (best looking too) headphones that I have ever heard, then again they are the most expensive I have ever bought. The weight just kills it for me. I have not owned it but I did try my friends. He had probably put 100 hours break in on them. They sounded OK but I wasn't really tempted to buy them. No insult intended but the price high to me because it wasn't the kind of sound I like. Don't get me wrong, they do sound good, but the balance of the sound was a little off to me, The highs we a little sibilant and the mids got lost when the lows kicked in, but my hearing is not the greatest so what sounds balanced to me doesn't really sound balanced to everyone else.. lol. But I really did like the look of them, had they been in the five to six hundred dollar range I probably would have picked them up because I could hear potential and was pretty sure that if I eq it I would get my sound out of them but for the 1k plus price tag, they needed to come out of the box without me having to do that. Which MrSpeakers are they going to drop next week? No insult taken at all. Everyone hears music their own way for sure!!! Yes, the $1800 price tag is daunting, and I expect to get maybe 1/2 as much for them. They definitely need a good amp, imo to sound their best. My best amp at this time is the Schitt Jotunheim with multibit DAC, which sounds great to me. I can only imagine what a better setup would sound like. They look like they will be very comfortable, and the $899 price tag is one I can live with. That is definitely something to think about. I didn't try it on my Jotunheim, I used my aune X7S, it didn't occur to me to swap amps, expecially since I love the aune and it is my go to amp. I will say that even with that, I would rather buy the ether cx at that price than the LCD CX, especially since I don't think they would get much better than my LCD 2 C Closed. I could be wrong though. When you settle on an asking price let me know and I will pass the word around incase anyone I know is interested. Quite a few of my friends love my Closed so they may be interested in the CX. As for the Ether, I really do hope they drop, I will be first in line to buy those. Been trying to pull the trigger on the E flow C closed for a while now but they are hard to get at a price less than market value. I have been trying to get a refurb for about 6 months now and even those go way too fast. How did you find out about the drop? I've been looking around to try and see if there is an upcoming drop list and have not been able to find anything. My rock bottom price with no haggling, etc would be $900 shipped in the USA. Thanks for the link, and the heads up, very much appreciated. I dropped a buddy of mine a text after you mentioned selling them and he was interested in finding out the price tag. I'll text him in the morn with you BL price, he has been coveting my closed and he did like my other friends CX so i'll keep my fingers crossed for ya. If he does buy them from you then I expect a cut of the action, my fee will be 1 Cent. The exact change you will have left over from the Ether CX purchase.. lol. BTW, you know anything about tube amps? I am thinking about picking one up since I have never owned one and would like to see what kind of sound it will bring to the party but am not really sure what I should be looking at. I keep hearing about the DarkVoice and the Little Dot for the most part. I am kinda hoping to ease my way into it at a reasonable cost since I am not sure if I will like the tube sound. I am old and remember tube amps from my childhood, they didn't really sound to great back and am not sure if they will sound much better now considering it is ancient tech that the world has left behind. How far could it have advanced in the last 50 years considering everything has been pretty much digital since the 80's.... God I'm old. Tube amps, I have a Vali2, which is a hybrid, and a Darkvoice 336se. It depends on how much you are willing to go down the rabbit hole with tube rolling. Ebay is your friend in this regard. You can spend anywhere between $40-$1000 on tube rolling, depending on how far you want to go, and how rare the tubes are. To me though, for the Darkvoice, replacing stock tubes with a RCA NOS 6AS7 & a Shanguang Treasure for the 6NS7 slot. The latter is the more expensive, but is as good as tubes 3X the price. Both of those should not run more than $130. This to me is the best sound I've heard from a tube amp. If you like the sound of an old Marantz receiver with the old Advent Speakers, this is what it is like to me. Definitely a "vintage" sound, imo. I guess I am also "vintage" these days, being born in 1969. I have never heard the Little Dot, so I am unsure about those. You would not believe the price of some OLD Russian and German tubes, it's crazy. My father in law had SO many old tubes, as he was an engineer, but repaired radios and tv's on the side. After he passed, they were thrown all away, I wish I would have known then what I know now. It was a goldmine. I would like to get a Bottlehead Crack, with the Speedball Mod, but since I got hurt at work my hands do not work as well as they used to for soldering. Also I know Woo Audio makes some great tube amps that start in the $800 range I believe. Hope that helps at least a little bit. you for sure gave me something to think about. I may just pick up something with decent reviews on the lower price tag side just to see if the difference in sound is going to be something that I will actually want and use. The Little dot seemed pretty promising, I just have to figure out if it is going to put out enough power to drive some of my higher end gear. I will say that if they do add that warmth and dated flavor to the sound and that transfers to something like my 800S then I might be screwed.. lol. Thanks for all the input, it is much appreciated. Hmm if you don't like the "vintage" sound the Vali 2 is a hybrid tube amp where the tube is used for voltage gain. The Vali 2 does not have a typical warm "tube sound" although it is possible to roll a warmer tube to taste. It has plenty of power for the HD800S and offers a lot of performance for the money , imo. Just a thought.